The Medicare Pharmacy fraud accused trio. Three employees of Medicare Pharmacy were Thursday morning arraigned on a charge of misappropriating funds and they were granted a total of GYD$450,000 bail. 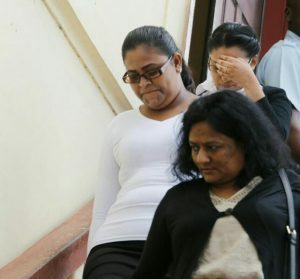 Appearing before Chief Magistrate, Ann McLennan at the Georgetown Magistrates’ Court were 23-year old Watmattie Ramnarine, 43-year old Zalena Khan and 23-year old Salena Khan. The prosecution alleges that between September, 6,2016 and June 2,2017, while being a clerk or servant attached to the Medicare Pharmacy they fraudulently embezzled GYD$650,240 which is the property of that business. Police further alleged that between May 4, 2017 to June 15, 2017 they also fraudulently embezzled GYD$1.6 million dollars also property of Medicare pharmacy. The Chief magistrate granted bail in the sum of GYD$150,000 to each of the defendants. She requested that the trio report to the Fraud Section of the Criminal Investigations Department every Friday until the completion of their trial. The matter has been adjourned to August 4, 2017.